Prism Sound and Hill Acoustics are proud to introduce a new line of compact Tetrahedral Test Chambers (TTCs) for consistently stable, convenient and affordable loudspeaker measurements to the new international standard IEC60268-21. Using a TTC it is not necessary to work in an anechoic chamber and furthermore the TTC allows measurements below the lower limit of most practical anechoic chambers. The TTC brings precise and repeatable free-field loudspeaker measurement over the full audible frequency range within reach of every audio development engineer. The Tetrahedral Test Chamber ensures a precisely defined, stable and modally minimised environment, completely free from the set-up variations that clouded results from former less precise measurement setups. 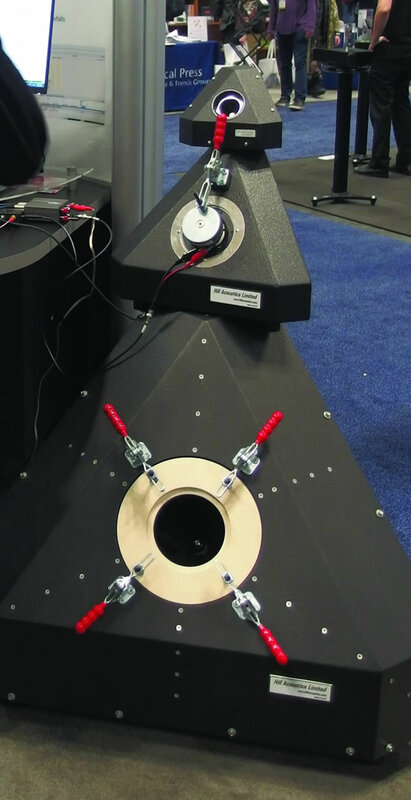 The Tetrahedral Test Chamber's low frequency response is calibrated and a frequency response correction curve is supplied with each chamber which can then be appled to results measured by the internal microphone. High frequency internal reflections are sufficiently absorbed by internal dampling materials so that the measured HF response can be combined with the compensated LF response to provide an equivalent, accurate free field response. Tetrahedral test chambers provide free field response with best repeatability over the widest bandwidth while also offering a compact and economical solution. Contact us now for pricing and availability or for advice on which size to choose! Hill Acoustics TTC manufactured in the UK by Prism Sound Test & Measurement division under license from Hill Acoustics. These specifications are provisional and may be changed without notice.